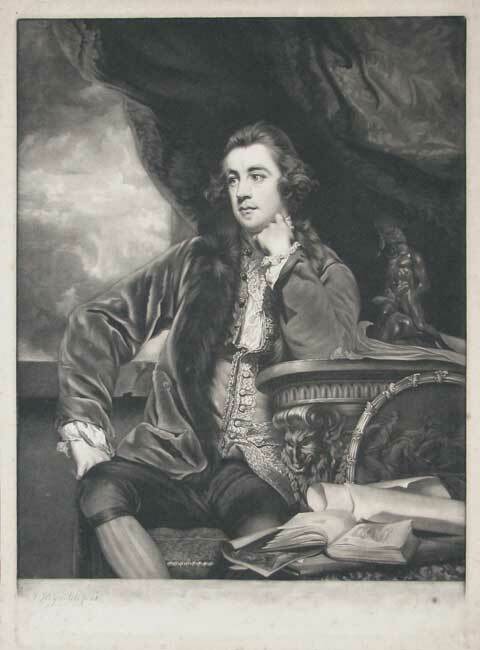 A three-quarter length mezzotint portrait by James Watson after the painting by Joshua Reynolds; published in London in 1767. This handsome portrait depicts Francis Russell (1739-67) as Lord Tavistock, in thoughtful pose surrounded by the accoutrements of his Grand Tour travels in Italy. There is a bronze statuette of Samson and a book of classical etchings. He sits at a carved table with satyr mask and rests his head upon his left hand. Joshua Reynolds painted the portrait between 1765 and 1766 when Tavistock was in his late twenties. His sister Caroline married George, the 4th Duke of Marlborough thereby uniting two illustrious aristocratic families. James Watson was born in Ireland in 1740 and died in London at the age of 50 in 1790. He was a perfectionist and had a reputation for scrapping plates that did not meet his high standards, choosing to start again rather than rework or alter a plate, as less scrupulous artists would have done. He was, therefore, a perfect choice for Sir Joshua Reynolds whose own standards were so exacting. He gained a reputation for the finest work and was consequently in constant employment; his output was prolific and his portraits include many of the leading figures of the day.